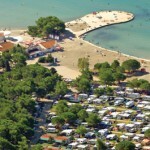 Camp Zaton is situated in Zaton bay in the Zadar channel, close to the small historical town of Nin. The area has a rich history with remnants dating back to the Roman Empire. 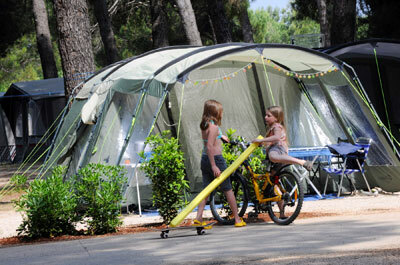 It is a large campsite, with a capacity to accommodate up to 4500 people over an area of 30ha. 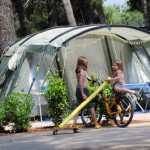 The camp offers both mobile homes and pitches in different price classes. Shops and restaurants scattered along the short path to the sea creates the atmosphere of a small town of its own. The camp even has its own disco and hairdresser, which says it all! 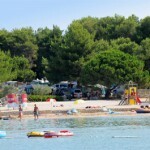 The beach is very nice, as in the whole of Dalmatia. Its blue shallow waters stretch over 1.5km, making it ideal for small children. Even though the beach is excellent, you will quickly notice that the children often seem to have a weakness for the hot pools. No wonder, considering the water slides, jumping centre, the illuminated bridge, etc. Camp Zaton offers mobile homes as well as pitches. It has numerous entertainment facilities and offers animations in abundance. Who wouldn’t like a breakfast on their own terrace? The mobile homes offer that and much more. With your own shower, living room with SAT-TV, etc; this is the most comfortable accommodation the camp has to offer. 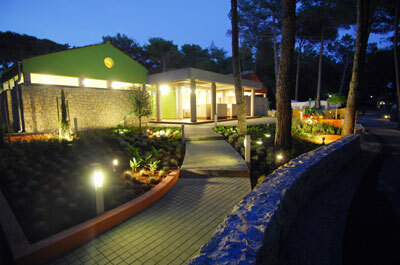 The bungalow comes in 3 different sizes, between 24-32m2. Mobile homes are built to comfortably accommodate up to 6 people. 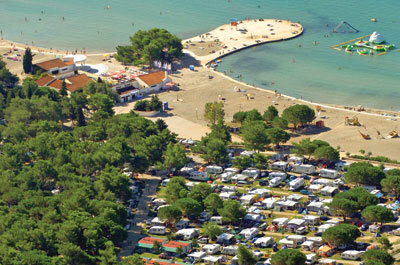 The camps 1300 pitches are divided into 3 areas depending on the distance to the beach. 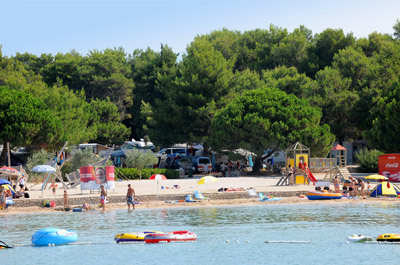 Pitches vary in size between 90-100m2, and have all the general necessities, such as electricity, water and hook-up connections. Reservation is possible. Zone Z is a “non parcel zone“. It is farthest away from the beach but also cheaper and less crowded. Here reservations are not required. Toilets and sanitary units: Sanitary facilities are fully renovated, with bathrooms for disabled, shower cabins, washing machines, dryers, pet washing area, hot water wash basins, discharge for chemical WC, chemical toilets on campsite, area for changing babies. Food & drinks: Several restaurants and bars are located within the camp area. There is a supermarket with fresh fruit and vegetables. Shops: Several small shops can be found within the camp, including newspaper stands. There is also a supermarket where fresh fruits and vegetables can be found. Other facilities: Propane gas filling station, car and trailer service, infirmary, hairdresser, exchange office, ATM cash dispenser, Internet cafe, jewellery store, possible to launch your own boat. 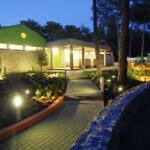 The camp has a huge variety of sport an recreational facilities to offer. For example, it has more than 20 tennis pitches, grounds for football, volleyball, table tennis and mini-golf. There are several sport schools such as diving, tennis, swimming and sailing. The area is excellent for biking and of course for water activities. There are fitness and aerobics programs by the beach and pools. At camp Zaton you will never be bored, that’s guaranteed! Children’s pool with water jets, mini disco, and mini driving school, jumping centre, games and contests are arranged by the camp. The Church St. Cross. Built the 9th century, thes gorgeous little white church is also known as “the smallest cathedral in the world”.